Smith No. 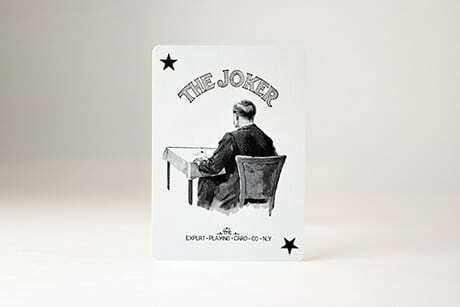 3 by The Expert Playing Card Co. is our latest and final installment of our Erdnase 1902 series. 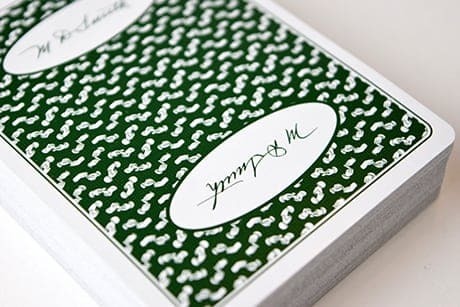 This deck has the Smith hands pattern (by Guy Hollingworth) with two casino style ovals that have M.D. 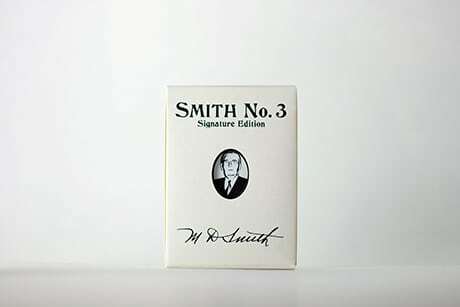 Smith’s signature on them. This signature was taken from a copy of Erdnase we have in our library. 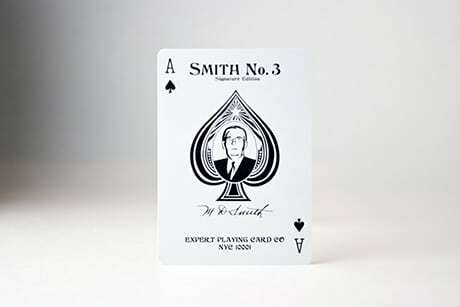 The Ace of Spades has a rendering of Mr. Smith’s face (like Willis Russell used to do) and the tuck has a die cut hole so you can see Mr. Smith while the deck is closed. Don’t miss out on this chance to complete your Erdnase 1902 series! 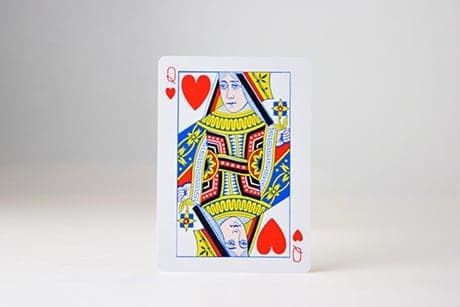 This deck, like all decks from Expert Playing Card Company has been carefully produced to be the finest handling deck presently produced in the world. 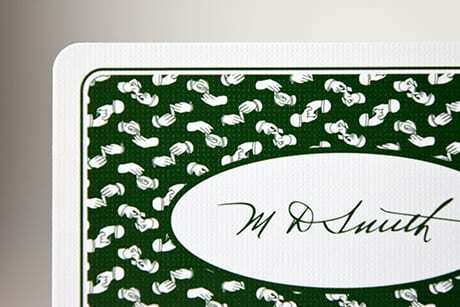 Cardists will notice the Master Finish allows for smooth and easy fans and other flourishes. Faro shufflers will see that our edges are the finest cut edges possible in the world. They will perfectly faro either face up or face down right out of the box. 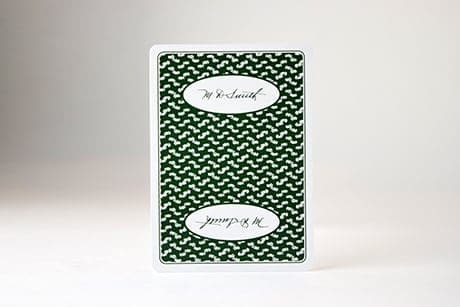 Card collectors will also notice that the registration on our decks is perfect. 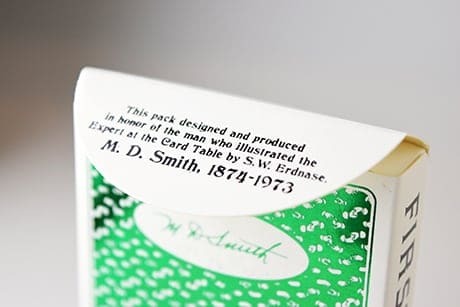 You do not get cards with inconsistent white borders from The Expert Playing Card Company. 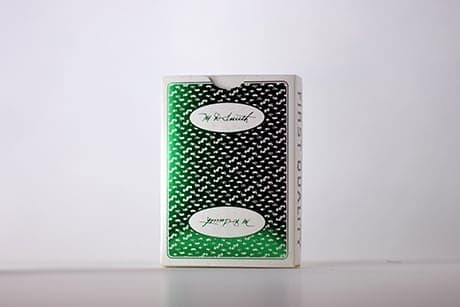 Our guarantee is: If this deck does not perform up to your standards we will refund your money for all unopened decks that you return in new condition. You will have to pay postage back to us and we will only refund the purchase price and not the outgoing postage. 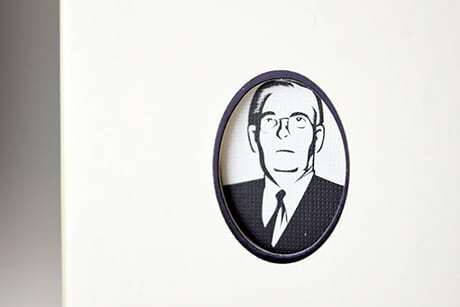 Master – Very thin and very firm. This stock is the most like Jerry’s Nugget that we have been able to get. 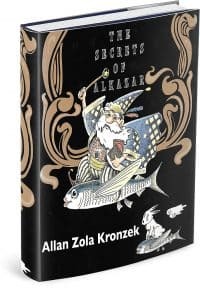 The choice of many of the masters. Semi-smooth but does have a subtle embossing pattern.